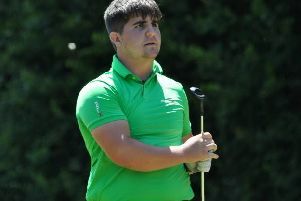 Lewis White of Northampton Golf Club lifted the NGL Club Champion of Champions title after shooting a level par 72 in the final at Wellingborough. David Gottsch (Staverton) and Richard Dalton (Overstone) were next on 74 apiece. Northants County’s Tony Lord used all his experience in the NGL Scratch Matchplay KO Final as he beat James Northern with one of the 36 holes still to play. Craig Cotterill and Gary Osborne (Hellidon Lakes) were successful in the NGL Fourball Betterball final as they recorded a 3&2 win over Karl Byron and Mark Conway (Cold Ashby). Five net birdies in a seven hole stretch either side of the turn helped Marcel Aarts (Kettering) and Mary MacLaren (Wellingborough) win the NGL Mixed Fourball Betterball crown at Northampton. The duo grabbed 42 points to finish one ahead of Staverton Park’s Barry Harding and Samantha Harding, with two pairings a further point adrift. MacLaren went into the event in winning touch after claiming the gross prize in the NGL Ladies Seniors Championship at Farthingstone. The Ireland international nudged one stroke ahead of Overstone’s Gill Hodgson, who enjoyed a convincing victory in the net category after posting a net 72. Lorraine Gilder, Sue Pawson and Gill Snelson finished in the prizes, while the Tazza Trophy went to Rosie Cullis (Kingsthorpe) with 33 points. Northampton’s David Dare and Colin Dare were the combination to beat in the NGL Seniors Pairs Open at Wellingborough as they fired the leading score of 42 points. Peterborough Milton duo Ian Kerr and Geoff Dyson were made to pay for a slow start to the back nine as they had to settle for the second prize with 41. Heavy and persistent rain on Saturday lunchtime made the course at Cold Ashby unplayable for the NGL Izzard Trophy, so the three-man team event was cancelled. No alternative date has been arranged yet. Northampton’s Katie Amos seems to enjoy her seasonal county girls competitions in 2016 as she added the Autumn Cup to the Spring Cup she lifted earlier in the season. Emily Horsted (Peterborough Milton) was successful in the nine-hole Autumn Cup, while Rayner Edwards and Caitlin Worth (both Whittlebury) won the Introductory Pairs comp, which was also played over nine holes. Peterborough Milton A got the better of Peterborough Milton B to clinch the Junior League crown with a 5-1 success on their home course in the final. After the opening match was halved, captain Ben Morris earned the A team the lead by winning the 16th and 18th holes against Adam O’Brien, whose driver shaft snapped with five holes to play. Ben Baker and Jade Roberts couldn’t be separated in the next game, before Kai Raymond moved the A team within touching distance of victory with a 4&3 win. The honour of bagging the winning point went to Lisa Johnston as she beat Rylan Thomas on the 15th hole, while Harry Smith completed the scoring by slotting in a long putt on the 17th hole. Northampton improved their chances of avoiding relegation from Scratch League Division One with a crucial 5-3 home victory over Wellingborough, who now prop up the standings. Lloyd Skidmore (6&4), Darren Matthews (2&1) and Andy Limbert (4&3) gave the home side the ideal start, with Chris Billson replying for Wellingborough. With Lewis White (5&4) and Jon Harris (4&3) sharing the last two points, Northampton’s hopes of victory depended on taking something from either of the middle two games - both of which went the distance. Dominic Jessup made sure the hosts didn’t endure an anxious wait as he secured a half against Adam Sherlock, before Ross Skidmore did the same in the other match with Ryan Connolly. Title-chasing Peterborough Milton could hold the key to relegation as they host Northampton on Saturday before travelling to Wellingborough 24 hours later. Overstone are not out of the relegation dogfight just yet and may need to get something from their home game with leaders Northants County on Sunday to maintain their top flight status. Cold Ashby kept alive their promotion ambitions with a 5½-2½ home victory against pacesetters Priors Hall. All the damage was done early on as Bradley Green secured a half for Ashby in the opening tie before James Lovett (3&1), Paul Fuller (4&3) and James Gibson (4&3) added points. Dennis Mathers (5&4) confirmed the team win, Jim Burberry (4&3) secured another victory for the hosts before Priors Hall grabbed a couple of consolation points late on. The Corby club, who have not won a match since July, remain in the box seat and will confirm top flight golf for next season if they defeat bottom club Brampton Heath on Sunday. Ashby will be hoping to pounce on any slip up by the leaders as they travel to Kingsthorpe, who only sit one point and one place above the relegation zone, on the same day. Northampton will host the final on Sunday as Kettering go in search of their first ever Intermediate League title by taking on 2009 champions Collingtree Park.